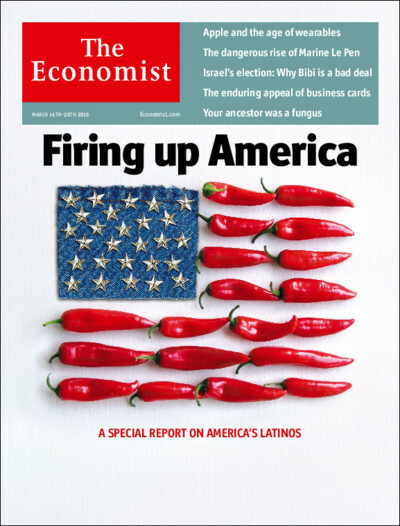 This week’s issue of the Economist reduces the vast diversity of Hispanic Americans to a single fruit: chili peppers. The administration’s flagrant violations of the Constitution, the push to favor illegal aliens over anyone who’s a legal immigrant (I can go on all day) don’t fire up Vox’s belly, but chili peppers do. My latest article, The Economist lowers the bar on low expectations, is up at Da Tech Guy Blog. 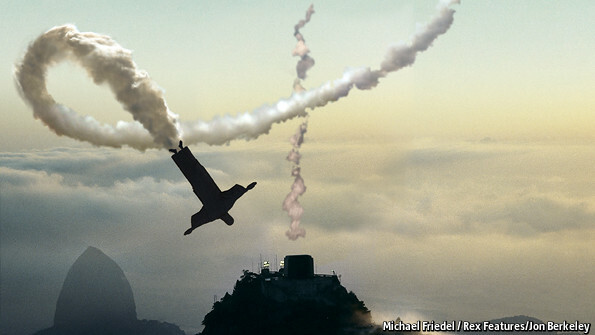 The Economist is asking, Has Brazil blown it? It needs to rediscover an appetite for reform by reshaping public spending, especially pensions. “All you have to do is read the records of the São Paulo Forum and observe the conduct of the Brazilian government,” he said. “The friends of Luis Inácio Lula da Silva, of Dilma Rousseff and the Workers Party are the enemies of the United States: Chavist Venezuela, first with (Hugo) Chávez and now with (Nicolás) Maduro; Raúl Castro’s Cuba; Iran; Evo Morales’ Bolivia; Libya at the time of Gadhafi; Bashar Assad’s Syria. please write more about the Forum of Sao Paulo, the organization created by Brazil’s Lula and Castro to change Latin America into an united Marxist region. Brazil has totally fallen to Marxism and is now engaged in the help of all marxist partners. Brazil has already received the first of 4000 Cuban physicians who will come to indoctrinate Brazilian poor people on the wonders of communism. These guys are not even certified as doctors and are slaves who never see their salaries (money goes directly to Fidel). Add to that the immense, structural corruption, and the drug trade from fellow Foro member Bolivia. Is The Economist’s image a good summation of the country’s situation? The Hispanic American Center for Economic Research (HACER) and the Fundación para el Progreso “Jean Gustave Courcelle-Seneuil” of Chile, joined efforts to publish and promote “Interventionism and Misery: 1929-2008″ a book devoted to understand the nature of past and future economic crises around the world. 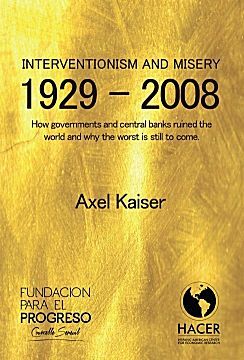 With a perspective of Austrian economics, Axel Kaiser explains the causes of the Great Depression in 1929, the crisis that started in 2008, the role of statism in the road to ruin and the key importance of the gold standard and capitalism for a prosper future. The national debt jumped by $72 billion on Tuesday even as the Republican-led U.S. House of Representatives passed a continuing resolution to fund the government for just three weeks that will cut $6 billion from government spending. If Congress were to cut $6 billion every three weeks for the next 36 weeks, it would manage to save between now and late November as much money as the Treasury added to the nation’s net debt during just the business hours of Tuesday, March 15. Congress would need to cut spending by $6 billion every three weeks for approximately the next six and a half years (338 weeks) just to equal the $676.3 billion the debt has increased thus far this fiscal year. Today’s podcast at 11AM Eastern will be on The Economist’s report on organized crime in Mexico. The Carnival of Latin America and the Caribbean will come up later today. Despite his resounding electoral victory, his solid majorities in both chambers of Congress and the obvious goodwill of the bulk of the electorate, Mr Obama has seemed curiously feeble. There are two main reasons for this. The first is Mr Obama’s failure to grapple as fast and as single-mindedly with the economy as he should have done. His stimulus package, though huge, was subcontracted to Congress, which did a mediocre job: too much of the money will arrive too late to be of help in the current crisis. His budget, though in some ways more honest than his predecessor’s, is wildly optimistic. And he has taken too long to produce his plan for dealing with the trillions of dollars of toxic assets which fester on banks’ balance-sheets. The failure to staff the Treasury is a shocking illustration of administrative drift. There are 23 slots at the department that need confirmation by the Senate, and only two have been filled. This is not the Senate’s fault. Mr Obama has made a series of bad picks of people who have chosen or been forced to withdraw; and it was only this week that he announced his candidates for two of the department’s four most senior posts. Filling such jobs is always a tortuous business in America, but Mr Obama has made it harder by insisting on a level of scrutiny far beyond anything previously attempted. Getting the Treasury team in place ought to have been his first priority. Second, Mr Obama has mishandled his relations with both sides in Congress. Though he campaigned as a centrist and promised an era of post-partisan government, that’s not how he has behaved. His stimulus bill attracted only three Republican votes in the Senate and none in the House. This bodes ill for the passage of more difficult projects, such as his big plans for carbon-emissions control and health-care reform. Keeping those promises will soon start to bedevil the administration. The Republicans must take their share of the blame for the breakdown. But if Mr Obama had done a better job of selling his package, and had worked harder at making sure that Republicans were included in drafting it, they would have found it more difficult to oppose his plans. And don’t get me started on foreign policy. 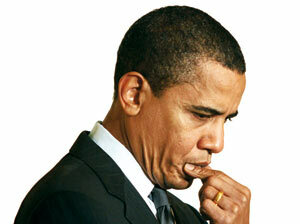 Obama, alas, is the worst of both worlds, having neither gubernatorial experience nor much Washington experience. He’s been an incredibly talented dilettante, getting elected to one job and then the next without learning the ropes. He’s a fast learner and will get the hang of it but, to come back to the Hillary Clinton quip that starts the Economist piece, “the Oval Office is no place for on-the-job-training.” Except, as already noted, that it usually is. This is the point: The nuancey boys were wrong on Obama, and the knuckledragging morons were right. There is no post-partisan centrist “grappling” with the economy, only a transformative radical willing to make Americans poorer in the cause of massive government expansion. At some point, The Economist, Messrs Brooks, Buckley & Co are going to have to acknowledge this. If they’re planning on spending the rest of his term tutting that his management style is obstructing the effective implementation of his centrist agenda, it’s going to be a long four years. Not Like We Didn’t See this Coming.